Located on a hilltop near Bhuj, this temple is dedicated to goddess Tapkeshwari. Apart from the simple and serene temple, the hill is also a great place to be, thanks to its pristine location. Covered with flora and fauna on a hill that has many caves, a day trip to Tapkeshwari is recommended. The rock cut by dripping water has formed a unique formation that will make you marvel at the nature. You can also enjoy a panoramic view of Bhuj from the temple. How popular is Tapkeshwari Temple? People normally club together Shree Vagashwari Mataji ' S Mandir and Bhuj Airport while planning their visit to Tapkeshwari Temple. This place has an historic past, stands because of its history. A less maintained temple here. Nice place to spend time with family. Near to haripar village of bhuj. 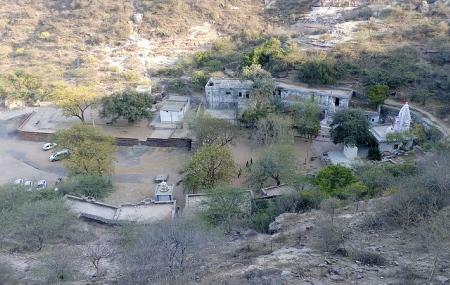 ancient temple, great views and fine photography spot as there are many caves, trek trail and fantastic reppaling spot.